Lexi Leonetti, junior English major, participated in a Reed winter externship. Read on for her reflections on her time at Method, an experience design firm. For ten days this winter I had the opportunity to extern at Method under the sponsorship of David Lipkin ’91. David was a history major at Reed and founded Method in San Francisco some years after graduating. Today, Method has over 200 employees in three offices: SF, New York City, and London. Method has collaborated with a multitude of companies ranging from Lush Cosmetics to TED to Google. Their clean and intuitive designs are award-winning, but their work isn’t limited to design; I think placing them somewhere between branding and product consulting is probably the most accurate way to describe their role. Ultimately, it all depends on the specific needs of each client (and what Method finds that they need). In an initial one-on-one meeting with David, he explained how the best consulting and design comes from finding that essential “thing” about a product or service. What purpose does it serve and why would people (ideally) want to use it? To determine that, Method has a talented team of astute and perspicacious collaborators who know how to think outside a traditional problem-solving process — because they understand that knowing the process has nothing to do with the outcomes. Often times people make a beautiful, substantial “solution,” but it doesn’t solve the right problem or fulfill the exact need. The analytical skills gained from being at Reed are essential to this part of Method’s approach; though Reedies don’t necessarily have the raw craft skills, we have the ability to assess problems and see how your answer can solve the right questions. Over the course of ten days, I conducted research audits, prepared a presentation of those audits, collected stock photos to fit a presentation of a proposed user journey, participated in an all-day brainstorming session where we tracked several user journeys provided with every possible technological availability, and wrote an entirely new manifesto for the company Method was developing a proposal. This externship went beyond the concrete outcomes, though; simply being in the studio, becoming a temporary part of the team, and taking in all of the shared ideas and collaboration that’s so essential to Method’s work was just as significant as the rest of it. By hanging out, eating lunch at the studio, and striking up conversations with people over the studio’s Chemex coffee brewer (Stumptown was their roaster of choice, ironically enough) I got to hear how different people got to Method through their own unique career paths, as well as a feel for the industry as a whole, extending beyond Method. David Lipkin, Reed class of 1991, is one of the co-founders of Method, an experience design firm, which was founded in 1999. Method currently has offices in San Francisco, London, and NYC. 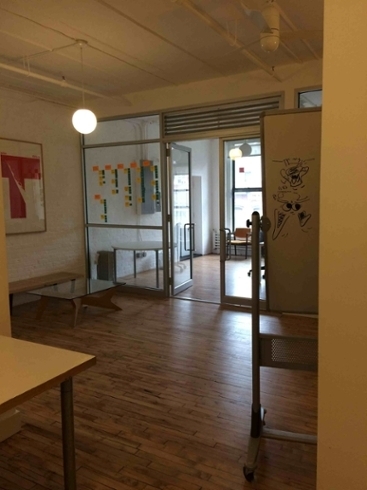 I spent two weeks at Method as an extern in the NYC office. While at Reed, David majored in history and also focused on anthropology. Currently, he manages the strategy and business development of the NYC office, though he also maintains an active role in many of the projects. Despite all of the projects, clients, initiatives, and goals that Method juggles, it doesn’t come off as a stressful place to work. Their fifth floor space is open and well lit; nobody has an office. There’s a basketball hoop mounted on one of the walls, and I quickly learned that late afternoon breaks to play games of dice were commonplace. Everyone was friendly, and interacted with each other as peers. Until I spent time at Method, I didn’t fully appreciate how valuable a relaxed and comfortable atmosphere is to facilitating creativity in the workplace.